The Sims 4 uses Cider. Well done EA, well done. 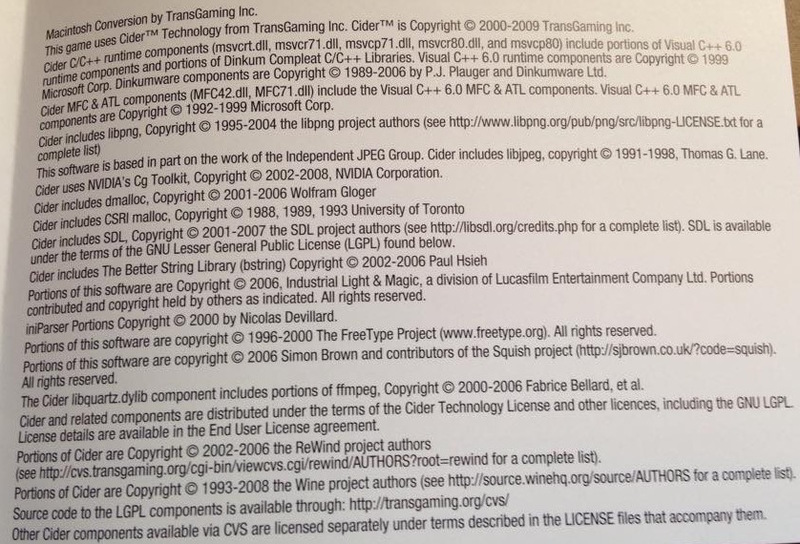 Yes, it seems that once again EA have decided to use Transgaming’s Cider wrapper to make The Sims 4 Mac compatible. This picture is from the manual for the physical copy of Get To Work: I’m astonished, given all the problems with The Sims 3, that EA would even think to use it again. A few years ago a Guru came on the Mac forum and stated that The Sims 3 Cider port was outsourced to a 3rd party to produce. Given that the game was so unstable on Macs they clearly didn’t do a very good job, not to mention never upping the RAM limit from 2Gb to 4Gb like Windows users received in a subsequent patch. @beyondsims @SimGuruShannon @GrimSuruDoi @SimGuruLyndsay @SimGuruSarah It's native! We've taken engineers across disciplines 4 our Mac team! but all subsequent EPs and GPs are somehow wrapped using Cider? Is that possible? EA have announced that all subsequent EPs and GPs will be released simultaneously on both platforms, something which did get me worried when I read it. Is this why the game has suddenly started slowing down for Mac users since the March patch and/or after installing Get To Work? There’s no doubt that the game is far more stable in OS X than The Sims 3 ever was, so EA at least appear to be doing something right. It’s such a shame that they couldn’t write it all natively for OS X though. I so wish Aspyr were still involved. The Sims and The Sims 2 ran like a dream in OS X.